FOR USE WITH ANY BRAND OR MODEL DRYSUIT FITTED WITH NEOPRENE OR LATEX SOCKS. The Tecline overboot protects the foot while diving and topside and allows easy walking. Constructed from heavy duty canvas outer. Strong nylon laces do not stretch. Side holes allow for easy drainage. Achilles loop for easy donning. High enough to offer tremendous ankle support. Can be worn with any brand of drysuit. May be used with neoprene or latex socks. Neoprene mesh allows easy drainage. 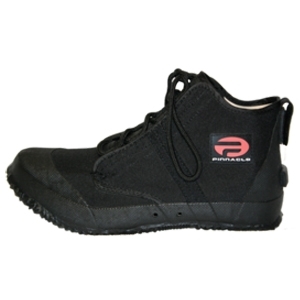 Rugged soles for walking on any surface. Available in UK sizes 4 - 14.